Dina is PWC’s Client Care Coordinator. She came to work with us after volunteering with Furkids for 7 years; the last 3 of which she was the shelter director. 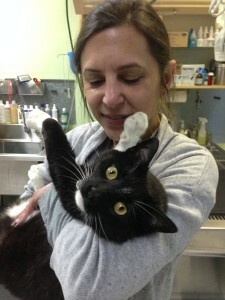 Dina has a lifelong passion to help cats but she excels in, and is drawn to, rehabilitating sick cats and nursing seniors with chronic illnesses. Dina finds hospice care very rewarding especially after seeing so many seniors given up at the shelter when they had many good years of love left to give. Dina is originally from Texas, but has resided here in the Atlanta area for 7 years. She maintains a multiple cat household with a revolving door of fosters, offers pet sitting services as well as in home fluids administration and nail trims, and plays the role of cat taxi from time to time. She enjoys playing with her cats, watching movies, gardening and Italian cooking.